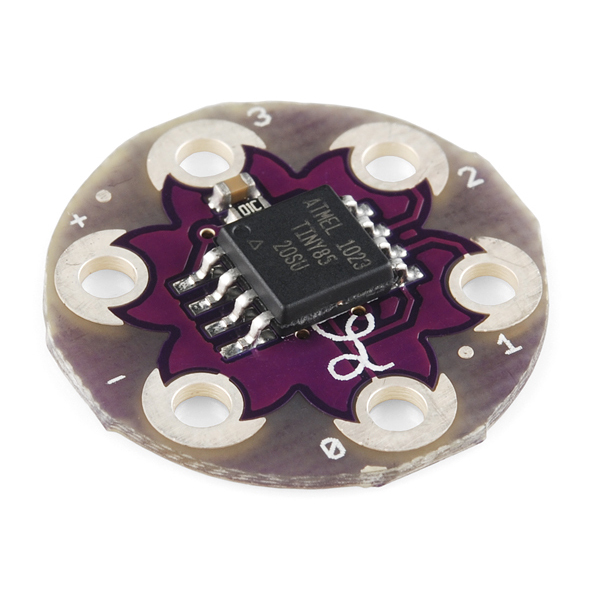 How to use SparkFun's LilyPad products to incorporate light into your textile projects! What I love about the LilyTiny and LilyTwinkle are how much they lower the barrier-to-entry for advanced e-textiles. The jump from extremely basic LED circuits to Arduino projects can be really daunting to those who have no programming experience at all. I should know, I had never looked at a line of code before I started e-textiles, and it's still a foreign language to me. The LilyTiny and LilyTwinkle let people who haven't had a lot of experience with micro-controller circuits start slow -- just building the circuit, using the pins, and enjoying a cool animated effect -- all without coding. • If you don't want to learn to program, or aren't ready yet, it will allow you to see and try out some of the cool effects that coded projects can produce. • It's a great way to learn micro-controller circuit design, so that when you ARE ready to start working with Arduino, you've already got half of the skillset you need under your belt. • Even if you already DO know how to program and build advanced circuits, if all you're looking for is a simple effect on a few pins, reprogramming this board is a cheaper way to do it than with a LilyPad Arduino. If you've wondered how to incorporate these elements into your own projects, we have a new tutorial up that covers one way to add mini LEDs to textile projects. We added them to a painted and screen-printed canvas, but they would work just as well in an item of clothing! Enjoy! You're correct - but they do come pre-programmed with twinkling or varied blinking code. This gives beginners a chance to see a finished project with a low barrier of entry and then they're hooked and ready to learn to program for future projects! I'm still waiting for a good tutorial on hoe to reprogram the lilytiny. More specifically a recommendation on hoe to hook up to the headers on the back of the board. I have a noob question... since we're dealing with electronics after all, how do you wash the shirt after you've sewed everything in place? Is the LilyTiny waterproof? You can wash all electronics, except they can't be connected to any source of electricity. You can throw your Arduino in the wash if you really wanted to! It may not be the best idea, but it can be done (without power that is). Just make sure there is ABSOLUTELY NO WATER left over!!! No room to bring out all 8 pins of the ATtiny?